GREEN BAY, WI (KTRK) -- A series of photographs of a person dressed as a creepy clown apparently prowling the streets of Green Bay, Wisconsin, is freaking people out, prompting calls to police, according to local news reports. Few details are available about the clown on the mysterious fan page,"Gags - The Green Bay Clown," but the first "sighting" apparently happened Monday around 2am. 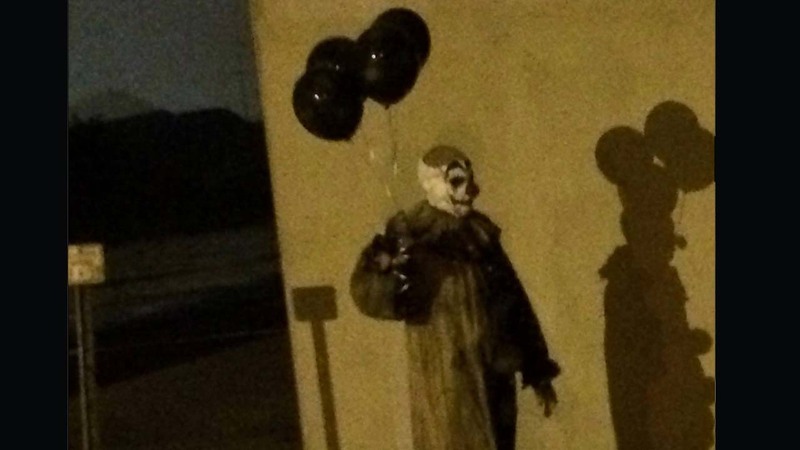 Seven photos are posted on the fan page, the clown carrying dark balloons and wearing what appears to be a very worn, dirty-looking costume and full face makeup near some type of parking lot beneath an overpass. From the coulrophobic -- those with a fear of clowns -- to people just curious about the costumed person carrying black balloons, talk on the Facebook page is full of speculation. It's unclear why the clown was dubbed "Gags." Some on the fan page speculate the photos are from a horror movie shoot or are a stunt or an attempt at viral marketing. Fan page commenter Susan Verderber speculated, "It has to be staged. Based off some of the pictures taken, and how close it is." Station WGBA reports the clown scare has prompted calls to police, but they can't do much because people are allowed to dress how they want as long as they are somewhere they are legally permitted to be. Some are hoping the person in the suit doesn't get hurt. Ian Biss wrote, "Ya, I wish they would get him in costume, and get out and add some more pics and video....this is a great idea...it'll be hard to keep him from getting hurt though...frightened people can do stupid stuff." We'll follow the story and if we have more on the clown, we'll bring it to you. Meanwhile, the Facebook page is calling for more photos, so if you see "Gags" in your neighborhood, you'll know where to post. As for us, we'll be hiding.